Reading Kitsap | The one-stop home for news and analysis concerning Kitsap's book-writing, book-selling and book-publishing communities. Kitsap Authors Help Write A Novel … Live! Bainbridge Island children's author Suzanne Selfors takes her turn onstage at "The Novel! Live" Wednesday at the Richard Hugo House in Seattle. The Novel: Live! is in its third day. 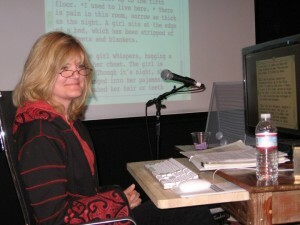 It’s a six-day endeavor in which 36 authors with Seattle-area ties — including six from Kitsap — each spend two hours writing a share of a novel before a live audience online at at the Richard Hugo House in Seattle. The event, in which audience members can purchase character names, is a fundraiser for two Seattle-area literacy-promotion programs. Once the event is over this weekend, the book will undergo a round of editing and then be released for sale as an e-book. Mary Guterson, who lived on the island until last year, takes her turn at 4 p.m. Thursday. (I expect to be on hand at the Hugo House for that, and will share some pictures.) Jamie Ford, the South Kitsap grad who now lives in Montana, takes the stage at 10 a.m. Saturday, and the last turn of the event will be taken by Bainbridge’s Susan Wiggs at 4 p.m. Saturday. It’s an interesting concept that was most famously tried in the mid-’90s, before the days of streaming Internet, by a group of 13 Florida authors. Their effort was the comic mystery novel Naked Came The Manatee. But The Novel: Live! is different expressly because of its live element, and that has caused some trepidation among some of the authors I know who are participating in this endeavor — authors who are used to writing amid quiet and solitude. It turned out to be really fun! My personal fear factor was that I would freeze up. I had a “cheat sheet” with me that just named places and ideas for people, to keep me grounded in images. I ended up writing over 2500 words in two hours, which is good for me. I joked with my editor that I should try writing in public more often. There were around ten people coming and going while I wrote. Two friends stopped by to have a book signed (which annoyed the organizers while I went off-camera to do so), and another friend stopped by while walking her dog, so we had a glass of wine after I finished. More people were watching and commenting online. When I asked for suggestions for names for the twins, seven sets were submitted! So we auctioned that off in the evening. I popped by this afternoon and it’s a really cool set-up. I’m not too worried about the “live” aspect. My first job out of college was working for a newspaper, which helps with the chaos-factor. At the paper I was at a desk, out in the open. Phones were ringing, people were always wandering by, police scanners were going off, that kind of thing. I think the “live” aspect is the best part, since writing is such a solitary job–the change up is exciting. As far as what emerges–It’s my sense that all of the writers involved are taking the story seriously, and the writing seriously, even though the process might be more of a spectacle. And of course it’s for a good cause. So there you are. Sounds like as much fun to be a spectator, too. Especially since the Hugo House is hosting happy hours from 4 to 6 p.m. and 8 to 10 p.m. each day. You better believe I’ll be all over that. You should too, if you’re in the Capitol Hill area and have the time to spare. 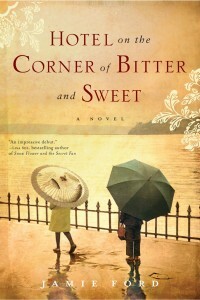 Did You Live In Your Own “Hotel On The Corner Of Bitter And Sweet”? Did you live in Kitsap County in the 1940s, especially during the war years? Did you and your family immigrate to America? Did you go through the bitter and sweet experience of blending the culture you brought from your home country into American society? Do you have 25 minutes to spare, to share a few of those stories? If so, the Kitsap Regional Library is very interested in hearing them. The call to collect these oral histories is part of the library’s One Book One Community program, which this year celebrates Hotel On The Corner Of Bitter And Sweet, the well-received, bestselling debut novel by South Kitsap High School graduate Jamie Ford. 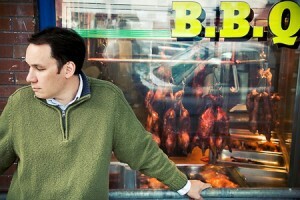 The above themes are the ones touched on in the book, which alternates in narrative between Seattle’s Chinese and Japanese communities in the 1940s and 1980s. The celebration will culminate in an Oct. 16 speaking appearance in Poulsbo by Ford, who now lives in Montana. Heidi Larsen, the Kitsap librarian heading the oral history project, explains further. If you’re interested, or know someone who might be, here’s how it works. First, call your nearest KRL branch. Library volunteers are being trained to conduct oral-history interviews for the project. Once you’ve set an appointment, your interview — approximately 25 minutes — will be recorded. You’ll later receive a copy of the interview on CD. Another CD recording of each interview will be catalogued into the KRL collection, along with photos of each interviewee, and be posted on the library’s website — krl.org. Sometime in November, the library system will host an Oral History Celebration, with all interview participants invited. Just a reminder that Jamie Ford has agreed to do a question-and-answer session for this blog ahead of his Oct. 16 appearance here. I’ll send off my questions and get that scheduled as soon as I finish reading Hotel On The Corner Of Bitter And Sweet. And I have to say, it’s pretty good. Maybe even quite a bit better than that. Which, from this confirmed mystery-and-true-crime junkie, may be saying something. Or maybe not. Wait A Minute … They Took A Taxi From Bremerton to Bainbridge Island? 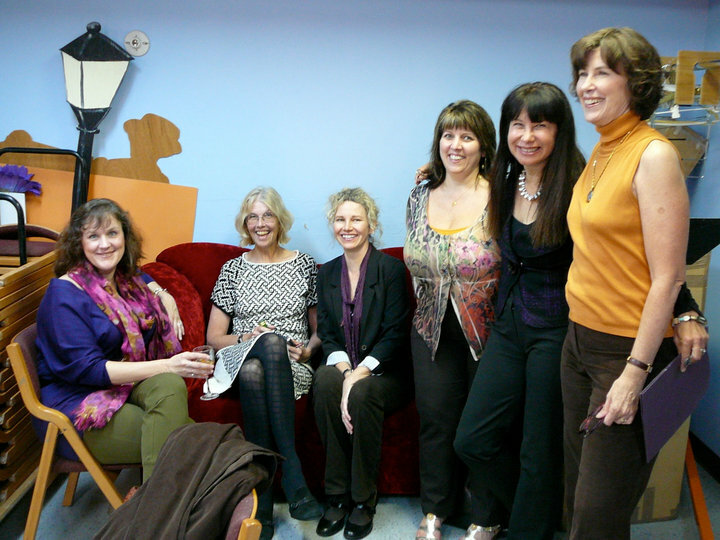 Last week’s “Between The Pages” event on Bainbridge Island wasn’t perfect, as you’ll see below … but it was a success. (Let me check that: Once things got to Bainbridge, things were perfect.) But an enthusiastic crowd of about 75, paying at least $50 a ticket, came out to support the Kitsap Regional Library system and listen to a powerhouse lineup of female authors — Jane Smiley, Josie Brown, Eileen Goudge, Joshilyn Jackson and Tatjana Soli — read from their latest books. Here’s a six-minute video of the evening‘s highlights, prepared by event organizers Robbie Wright and Liberty Bay Books owner Suzanne Droppert. It was a wonderful crowd! Friendly, inquisitive, and obviously avid readers. What I love, too is that there were quite a few teachers and librarians there as well. Eileen calls us “The Sisterhood of the Traveling Books.” Most of us met face-to-face for the first time just the night before, but you’d think we’d known each other for quite some time, the way everyone got along. Joshilyn is a consummate performer: you can tell she was an actress in her previous profession. Tatjana gives an eloquent read. 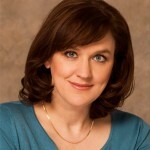 Her book is serious, but she is lighthearted and fun. She and her husband, Gaylord, dance the tango! The way back — this time the RIGHT ferry — was too short. It was fun just to sit together and recapped the fun. I hope everyone in the audience had as much fun as we had. If you want to know how quickly and surprisingly the business of publishing books is changing, look no further than the third floor of Sharlene Martin‘s house on north Bainbridge Island. There, the offices of the Martin Literary Management are a nearly nonstop buzz of activity. But it’s not buzzing just with the business-as-usual of the literary agency, which represents mostly inspirational memoirs, celebrity biographies, true crime and other commercial nonfiction — three of which were New York Times bestsellers in the past year. It’s buzzing because Martin and her crew are getting ready to publish their first book. Wait a minute. A literary agent publishing the work she represents? Is this how the publishing industry is supposed to work? Not normally, no. But what’s normal these days in book publishing, which is undergoing a seismic shift in how books are developed and distributed? “Not much,” Martin conceded with a laugh. A case in point is the book that’s generating the buzz. 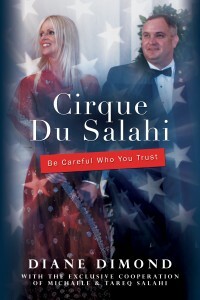 Cirque Du Salahi: Be Careful Who You Trust is the story of Tareq and Michaele Salahi, who Martin represents along with the author, investigative journalist Diane Dimond. The Salahis are the high-society Washington D.C. couple who made headlines back in November 2009 when they got past the Secret Service into a White House state dinner. The so-called “White House party-crashers” stirred up a lot of controversy and curiosity — more so the latter of late since Michaele Salahi joined the lineup of the reality TV show, The Real Housewives Of D.C.
It’s that latter fact that drove Martin to make the unusual choice to publish the Salahi story on her own, in cooperation with Amazon.com, because she wanted the book to come out in time to capitalize on the latest rise in profile for the couple. In particular, she wanted a product ready to buy before the TV series ended Oct. 7. So what was Martin’s alternative? In her view, to publish it through the CreateSpace program offered by Seattle online book giant Amazon. That took care of preparing and distributing print and electronic versions of the book. Everything else fell to Martin and her crew. “All the decisions a publisher had to make, I made,” she said. Another unusual quirk: Everybody involved is taking whatever financial rewards may result on the back end of the book’s release, in lieu of the advance-money arrangements commonly made with traditional book deals. “We’re calling it a sweat-equity book,” Martin said. The Kindle as well as trade paperback version of Cirque Du Salahi became available Sept. 15. A promotional blitz, largely centered on the East Coast where interest in the Salahis is strongest, will follow. In lieu of a traditional book tour with on-site signings in bookstores, Martin and Co. are arranging for “Virtual Book Chats” in which, at scheduled times, people can log on for a live chat with Dimond and the Salahis and participate in live question-and-answer sessions. Later, Martin, a frequent writing-workshop instructor, will try to use her self-publishing experiment as a teaching moment. “We want to set up a program at colleges around the country for journalism students, about how they can do this kind of project themselves,” she said. 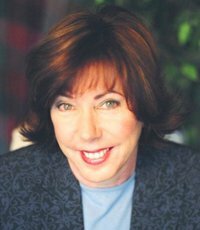 It’s a talk that Martin has walked for herself, having taken her first foray into author-dom last November with the release of Publish Your Nonfiction Book, co-written with Flacco and published by Writer’s Digest Books as a how-to guide for preparing would-be authors for publishing success. It should be noted that Martin’s foray into self-publishing hasn’t burned any of her many bridges with the traditional book-publishing establishment. As usual, she has several projects in play — most recently, she’s been working on a memoir by Hillary Williams, daughter of country music legend Hank Williams Jr. — and many are being published through big New York houses. But that doesn’t mean that Cirque Du Salahi is a one-shot deal. My guess is that she won’t be the only one. Are you on Facebook? Of course you are. The entire world is on Facebook. So is Reading Kitsap. I’ve created a Facebook page for this blog. If you’re on Facebook as much as I am, then you’ll like how it gives you a much easier way to keep up to speed on new blog posts. Also, I like to survey people there on various book-related topics, and post links to other items I think you might find interesting. Plus, there’s the whole connect-with-other-people-in-your-community-who-share-your-interests thing. And there’s the interactive component. I’ve decided to be pretty lenient about letting anyone who wants to share a link, a news tidbit or some media about the Kitsap literary scene — or the literary scene in general — do just that. If you’re a writer, book-club leader, or whatever, I’m pretty open to letting you promote your work on the Reading Kitsap wall as long as you’re not crass about it. So … go to your Facebook account, type “Reading Kitsap” in the search field, click “Like” once you get there, and join in the conversations. There’s 53 of already there, as of this writing, all of whom like, generally, the same things you do. Thanks for reading Reading Kitsap. And thanks for reading Kitsap. And thanks for reading. 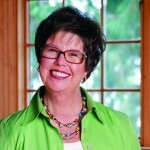 Debbie Macomber will be the featured speaker when the Peninsula Chapter of the Romance Writers of America meet at 10 a.m. Saturday at the Sylvan Way Branch of the Kitsap Regional Library in East Bremerton. The meeting is open to anyone interested. And Conner, a 1979 South Kitsap High graduate, is proof that it works. 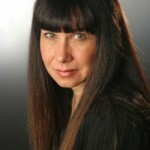 Her first published romance novel, Kilt By Love, will be released Sept. 27. (It was her seventh manuscript.) Congratulations, Jennifer. 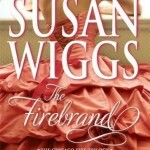 When Sasha Nolan loses her job as an events planner, she decides to take her dream vacation to Scotland. Her plan is to find out what Scotsmen wear under their kilts, but instead, she’s stuck on a tour bus of senior citizens. When she meets Allister MacTavish, a modern day laird, all that changes. There’s one simple rule for her vacation, kilt, conquer and leave. Can Sasha follow her rule when Allister asks for her help in creating a plan to rescue MacTavish Castle from financial ruin? Suddenly Sasha finds that she’s tempted to abandon her old life, help Allister, and indulge in every sexual fantasy she’s ever had. Because now, she’s found out what Scotsmen wear under their kilts…nothing at all. Way behind on this stuff, but trying to catch up a little at a time over the next few days. I wish I could be there; Bass sounds entirely too interesting. From his Wikipedia page: “He started writing short stories on his lunch breaks while working as a petroleum geologist in Jackson, Mississippi.” So let that be a little sunburst of inspiration to everyone who thinks they’re too busy with their everyday lives to write a book. Because you’re not. Authors of literature are usually valued in society as philosophers, sages and teachers. Oh, and quality drinking companions (in my experience, anyway). To that list, add superheroes. It’s in the latter mode that five highly regarded fiction writers from all over the United States are coming Thursday to Bainbridge Island for a public reading and reception. Their mission: To raise money for the cash-strapped Kitsap Regional Library system. The $50-a-ticket “Between The Pages” event, at the Bainbridge Performing Arts center, features one marquee name: Jane Smiley, the Pulitzer Prize-winning author of A Thousand Acres, a modern-day retelling of Shakespeare’s King Lear which was later made into a movie starring Jason Robards, Jessica Lange and Michelle Pfeiffer. Joining Smiley are four other female authors with strong national reputations: Josie Brown, Eileen Goudge, Joshilyn Jackson and Tatjana Soli. For 90 minutes, they’ll read from their latest novels (more on those below), interview each other and possibly take some questions from the audience, Wright said. They’ll stay for another 40 minutes after to chat and sign copies of their books. Brown is friends with Robbie Wright, a corporate events planner who lives on Bainbridge. When Wright told her last spring about the library system’s woes — budget cuts, past levy failures and the theft of children’s books from the Port Orchard branch — Brown came up with the fundraiser idea. They quickly enlisted Peter Raffa, director of the Kitsap Regional Library Foundation, and the three drew up a wish list of names. One glittery name at the top of their list — show-business novelist Jackie Collins — initially committed to the Between The Pages event. But, Brown said, Collins had to drop out when when the date for the London premiere of a movie based on one of her books shifted from summer to fall. Also having to drop out was novelist Lisa Rinna, who saw the release of her latest novel shifted to October. They got Smiley, their other top name, to come up from her Northern California home, however. 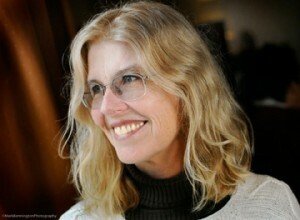 Goudge, a New York author with a second home in the Puget Sound area, came on board next, followed by Jackson, a Georgia resident, and Soli, who lives in Southern California. 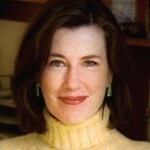 All write what could be labeled literary, issue-driven women’s fiction. Sad disclosure: As things stand now, I won’t be able to attend the event, as I must punch in for my regular Thursday swing shift at the paragraph factory in Bremerton. However, if you’re going and bringing a camera, would you mind sharing some of your shots with me so I can share with everyone? E-mail me at thomsen1965@gmail.com. And please share some of the funny anecdotes and other highlights of the evening. And cake, if there’s any. Tickets: $50 (includes copy of Brown’s novel, Secret Lives Of Husbands and Wives), with discount available for groups of eight or more; and $150 for “VIP” access, which includes a catered pre-event reception with the authors and copies of each of their latest novels. Purchase at Liberty Bay Books, 18881 D Front St., Poulsbo. 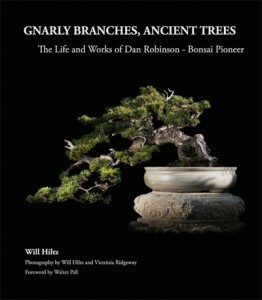 • Just got a note from the folks at Elandan Gardens in Gorst that a copy of Gnarly Branches, Ancient Trees: The Life and Works of Dan Robinson, Bonsai Pioneer has arrived at the home of the world-class bonsai art collection, even though the book won’t be formally released until October. Robinson, of course, is the world-renowned “Picasso of Bonsai” who makes Elandan his home base when he’s not off trotting the globe teaching others the exquisite tree-design art. At $49.95, the price may give pause, but, if you click on the link and leaf through a sampling of pages, you’ll see the the pictures are indeed exquisite. Ordering information is available there as well. • I asked Ollala crime author Gregg Olsen about his newest fiction thriller, Closer Than Blood. All he would tell me is that it features Kendall Stark, the Kitsap County sheriff’s detective featured in his most recently published novel, Victim Six. Oh, and that it’s set, like the last one, in Port Orchard. And it has “a serial killer with ties to the South Kitsap High School Class of ’94.” It’ll be out the first week of April, which is when the paperback version of Gregg’s latest true-crime book, A Twisted Faith, comes out. Gregg also reminded me that the “Dateline: NBC” program spotlighting the Kitsap case behind A Twisted Faith airs again on Friday, Sept. 24. He’ll also be discussing the story at a Nov. 12 fundraiser dinner for the Kitsap Historical Society. • Bainbridge Island author Anthony Flacco, another crime writer, has been no less busy than Gregg. I’ll have a blog post coming soon on an interesting project he’s immersed at the moment, but he’s also plugging away at his next novel. His fiction work to this point has been historical, but this time he’s trying something new. Anthony’s most recent books were The Road Out Of Hell, a well-received historical true-crime tale from the 1920s, and Publish Your Nonfiction Book, a Writer’s Digest book he produced last fall with his longtime partner, literary agent Sharlene Martin. • Garth Sundem was nice enough to send me his geektastic new book, Brain Candy: Science, Paradoxes, Puzzles, Logic and Illogic to Nourish Your Neurons, a couple of months ago, and I’m feeling guilty for not having mentioned it yet. The new book by the 1994 Bainbridge High grad, much like his first two, is a trip through the “intersection of science, math and humor.” It’s loaded with hundreds of funky little factoids, puzzles, logic tests and other ways of demonstrating how our malleable, easily tricked but surprisingly resilient brains work and how the science of putting it to work more efficiently has advanced. Sundem, who now lives in Ojai, Calif., eats up science writing and research with two spoonfuls. As a result, his bite-sized-nuggets of geekery require more thoughtful digestion than a potboiler novel. That explains why I’m just on page 73, and why, if I wait till I’m done to do a proper write-up, we’ll likely have a new president in the White House. So, to get a taste of what Brain Candy is all about, click here for some samples. Or watch this tremendously entertaining 2007 appearance on Good Morning America, in which Sundem banters with Diane Sawyer and shows how math calculations can determine whether or not couples should get married — or stay married. • And, speaking of former Bainbridge Islanders, Seattle author Brandon Kyle Rudd just released the latest edition of his Cooper’s Pack children’s travel guides, Cooper’s Pack Travel Guide to Seattle. 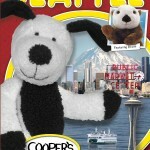 The 72-page picture tome follows the adventures of Cooper the dog and his pal, Elliott the otter, as they hop a ferry from Bainbridge Island and see the sights around downtown Seattle. The book, priced at $12.95, can come with plush toys and other kid-friendly accessories. Rudd — whose pen name on the guides is just “Kyle” — made his mark on Bainbridge as a kid in the late ’70s and ’80s, publishing the Winslow Advertiser shopper from his fourth through eighth grades, and later Exhibition, a well-regarded visual and literary arts magazine, through his high-school years. His Bainbridge school years made a lingering impression on him, as the bios of his characters at the end of his books throw shout-outs to some of his favorite teachers: Gary Axling (Blakely Elementary), Dave Layton and Eileen Okada (Commodore Middle School) and Paul See (Bainbridge High). • OK, one last ex-Bainbridge Islander (I get to do this because I happen to be one). Remember the big kerfuffle alluded to in a previous Reading Kitsap post about The New York Times’ alleged bias in book reviews toward white male authors from New York? Well, I found out that if you’re looking for Exhibit B to prosecute that case (Exhibit A being Jonathan Franzen), look no further than former Bainbridge resident Alan Furst. At a writer’s conference in the late ’80s, Mr. Furst went on to say, he ran into Peter Davison, then the poetry editor at The Atlantic Monthly and also an editor at the Atlantic Monthly Press. Mr. Davison said to him, “We looked at your manuscripts,” Mr. Furst recalled. “Do you want to know why we turned them down?” When he said yes, Mr. Davison said they were the most smart-alecky things he had ever seen. • OK. but nothing’s quite as awesome as this. Jamie Ford, the South Kitsap High grad who’s coming Oct. 16 to Poulsbo to speak as part of the Kitsap Regional Library‘s “One Book One Community” program, shared a funny story on his blog about a fanboy writer crush he’s long had on legendary science-fiction author Harlan Ellison. Seems that the acclaimed author of Hotel On The Corner Of Bitter And Sweet wanted to honor Ellison’s legacy of performance-theater writing — Ellison used to type short stories in a storefront window and give them away to those who watched — when he takes the stage at Richard Hugo House in Seattle next month for The Novel: Live! fundraising event next month. Facing a two-hour writing turn before a live audience, Ford wrote to Ellison asking the other man — now 76 — if he could wear a T-shirt of his at the event. Next thing Ford knew, he received a call at his Montana home from the man himself. As a result, Ford will take his turn on stage at 10 a.m. Saturday, Oct. 16, wearing a Harlan Ellison T-shirt. Thus concludes this edition of awesometasticness. Actually, wait, one more thing: Ford has agreed to do a Q&A with me in advance of his visit.